An online bachelor of business administration degree teaches the vital managerial and financial skills that are desired by companies all over the world. The online bachelor of business administration (BBA) degree – one of the most popular online bachelor’s degrees – teaches students how to manage people, work with numbers and improve their company’s performance. Online business school students will learn how businesses and organizations operate, grow and transform. Earning a business administration degree online will also teach students how to think creatively, analyze data and manage projects. Most online business degree programs allow students to specialize in an area such as finance, international business, computer information systems, accounting or marketing. What Is a Bachelor of Business Administration? What Courses Will I Take in an Online Bachelor of Business Administration Program? What’s the Difference between BBA, BSBA, and BABA? What are Some Bachelor of Business Administration Jobs? We selected the following business administration online degree programs based on the quality of the program and types of courses offered, in addition to the faculty, awards, rankings, and reputation, including the school’s reputation for providing excellent online degree programs. The University of Florida is a public sea-grant, space-grant and land-grant research university that was founded in 1853. With over 52,000 students, it is one of the largest universities in the nation. The University of Florida is a senior member of the State University System of Florida, and it offers hundreds of programs that lead to a host of undergraduate, graduate and doctoral degrees. 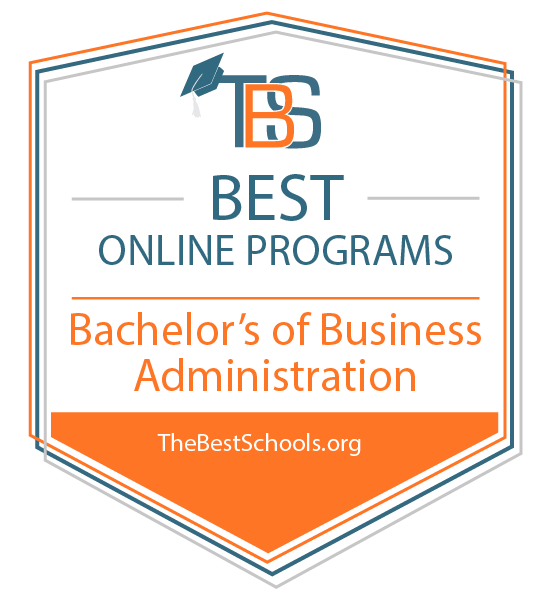 UF Online and the Warrington College of Business Administration offer the online bachelor of science in business administration degree with a major in general business provides students with a strong foundation in key business principles. Students receive instruction in business law, accounting, economics, marketing and more. The degree program prepares graduates for a variety of business-related careers as well as graduate studies in business. Graduates of the UF online bachelor’s degree in business are eligible for the university’s accelerated online MBA program. The University of Florida is accredited by the Southern Association of Colleges and Schools Commission on Colleges (SACSCOC). The university’s Warrington College of Business Administration also holds accreditation from the Association to Advance Collegiate Schools of Business (AACSB) International. The flagship University of Georgia is a public, land-grant, regional sun-grant and national sea-grant research university that was founded in 1785. Its 17 schools and colleges offer more than 140 degree programs in a host of disciplines; the University of Georgia enrolls about 37,000 students. The Terry College of Business online bachelor of business administration degree provides students with a strong business foundation. The program is designed for working professionals and military personnel, and it prepares its graduates for careers in management and entrepreneurship. Applicants must have at least 60 hours of transferable credits before beginning the bachelor’s degree program. Students then complete the remaining 60 credit hours in this program to earn a 121-credit-hour online business degree. The same faculty teach the university’s online and on-campus courses. The university offers the same tuition regardless of residency. Students can complete the bachelor’s degree in business administration online in three years, with cohorts beginning in January, June, and August. The University of Georgia holds accreditation from the Southern Association of Colleges and Schools Commission on Colleges (SACSCOC). The Terry College of Business also received accreditation from the Association to Advance Collegiate Schools of Business (AACSB International). Rutgers, the State University of New Jersey is a public land-grant and sea-grant university that was founded in 1766. Rutgers offers undergraduate, graduate and professional degrees to nearly 50,000 students. Through Rutgers Online, the Rutgers Business School offers an online Bachelor of Arts in Business Administration degree program. The curriculum is designed to give students who have an associate degree a broad foundation in business administration. Students learn to apply their business knowledge to real-world scenarios. Student can complete the program on a full-time or part-time basis. The university offers fall and spring start dates. Students can choose one of two tracks: a general track or hospitality management track. Rutgers also offers an online MBA degree program. Rutgers University holds accreditation from the Middle States Commission on Higher Education (MSCHE). The Association to Advance Collegiate Schools of Business (AACSB) also provides accreditation to the Rutgers Business School. Penn State World Campus is the online campus of Pennsylvania State University that launched in 1998. It offers more than 125 undergraduate and graduate degrees online as well as certificates in a variety of program areas. The Pennsylvania State University was founded in 1855, and it is a space-grant, sea-grant, land-grant and sun-grant university. The main campus enrolls more than 47,000 students. The faculty who teach the online program are the same faculty who teach the traditional program. Students who earn a bachelor’s degree in business online at Penn State World Campus earn the same degree as the on-campus students. Penn State World Campus also offers an online MBA degree program. Pennsylvania State University is accredited by the Middle States Commission on Higher Education (MSCHE). Its business programs are accredited by the Association to Advance Collegiate Schools of Business (AACSB). The University of Alabama is a public research university established in 1820. It enrolls over 38,000 students in a full array of undergraduate, graduate and professional degree programs. Students in the online business degree program may choose to focus on management or marketing. The University of Alabama is accredited by the Southern Association of Colleges and Schools Commission on Colleges (SACSCOC). The Culverhouse College of Business is accredited by the Association to Advance Collegiate Schools of Business (AACSB). Florida International University (FIU) is a metropolitan, public and research university founded in 1965. FIU’s nearly two dozen schools and colleges offer about 200 areas of study that lead to undergraduate, graduate, doctoral and professional degrees. FIU is a member of the State University System of Florida and has an enrollment of 56,000 students, which makes it one of the Florida’s largest universities. Florida International University also offers an online MBA program. Florida International University is accredited by the Southern Association of Colleges and Schools Commission on Colleges (SACSCOC). The College of Business is accredited by the Association to Advance Collegiate Schools of Business (AACSB). San Diego State University is a public research university that was established in 1897. It enrolls over 35,000 students in a wide variety of undergraduate, graduate and professional degree programs. The same faculty who teach the on-campus courses teach the online bachelor’s degree in business program courses. The courses utilize an eight-week delivery model. San Diego State University is accredited by the WASC Senior College and University Commission (WSCUC). The Fowler College of Business is accredited by the Association to Advance Collegiate Schools of Business (AACSB). The University of Massachusetts is a five-campus public university system that was established in 1964 and enrolls about 73,000 students. The flagship University of Massachusetts–Amherst was founded in 1863 and its nine colleges and schools offer more than 230 undergraduate, graduate and doctoral programs. Online students learn from the same world-class instructors who instruct on-campus courses. Umass Amherst also offers an online MBA degree program. The University of Massachusetts–Amherst is accredited by the New England Association of Schools and Colleges (NEASC). The Isenberg School of Management is accredited by the Association to Advance Collegiate Schools of Business (AACSB). Appalachian State University is a public university established in 1899. It enrolls over 18,000 students in a variety of undergraduate, graduate and professional programs. Through their App State Online platform, the Walker College of Business offers an online bachelor of science in business administration degree completion program for students who have already earned a number of undergraduate credits and now seek to complete their business degree. The program focuses on upper-level undergraduate education in key areas which include marketing, management, finance, organizational behavior and operations management. Students in the online bachelor’s degree in business program may complete their degree in two years on a full-time schedule, or four-and-a-half years on a part-time schedule. Because this is a degree completion program, applicants for the online bachelor of science in business administration must have a minimum of 70 transferable credit hours from an approved, regionally accredited institution. Appalachian State University is accredited by the Southern Association of Colleges and Schools Commission on Colleges (SACSCOC). The Walker College of Business is accredited by the Association to Advance Collegiate Schools of Business (AACSB). California State University–Fullerton is a public research university that was established in 1957 and enrolls more than 40,000 students. Part of the California State University system, Cal State Fullerton offers more than 240 programs that lead to bachelor’s, master’s and doctoral degrees. The Mihaylo College of Business and Economics at Cal State Fullerton offers an online Bachelor of Arts in Business Administration degree program with a concentration in professional business. Their degree completion program is primarily for business professionals who want to be more effective managers. Students in the online bachelor’s degree in business program are taught by the same faculty as their on-campus counterparts. The program may be completed in three years, though an accelerated option is available to some students. Applicants to the program must have a minimum of 63 transferable credit hours. California State University is accredited by the WASC Senior College and University Commission (WSCUC). The Mihaylo College of Business and Economics is accredited by the Association to Advance Collegiate Schools of Business (AACSB). Temple University is a comprehensive public research university that was founded in 1884 and enrolls more than 39,000 students. It offers more than 400 undergraduate, graduate and professional degree programs at its seven Pennsylvania campuses and its international campuses. Students must complete a capstone course. Students can pursue their online bachelor’s degree in business administration on a full-time or part-time basis. Online courses require real-time sessions and are taught by the same faculty who teach the on-campus courses. Temple University offers flat-rate tuition and out-of-state students pay the same as Pennsylvania residents. Temple University is accredited by the Middle States Commission on Higher Education (MSCHE). The Fox School of Business is also accredited by the Association to Advance Collegiate Schools of Business (AACSB) International. The University of Arkansas is a public, land-grant research university that was established in 1871. It enrolls over 27,000 students in a wide selection of undergraduate, graduate and professional degree programs. The University of Arkansas is accredited by the Higher Learning Commission (HLC). The Walton School of Business is accredited by the Association to Advance Collegiate Schools of Business (AACSB). Ball State University is a public university that was established in 1918. It enrolls over 22,000 students in a full selection of undergraduate, graduate and professional degree programs. Ball State’s online bachelor’s degree in business program uses both synchronous and asynchronous courses. Ball State also offers an online MBA degree program. Arizona State University is a public research university that was founded in 1885. Its five campuses, learning centers and 82,000 students make it one of the largest public universities in the nation. The university offers more than 350 majors which lead to undergraduate, graduate and doctoral degrees. Students in the online BABA must also complete a capstone course. The same faculty teach ASU’s online and on-campus courses. Arizona State University is accredited by the Higher Learning Commission (HLC). The W.P. Carey School of Business is accredited by the Association to Advance Collegiate Schools of Business (AACSB). The University of Illinois at Chicago is a public research university that was founded in 1913. It enrolls about 30,000 students in its 15 colleges and professional schools. The university offers more than 230 programs that lead to undergraduate, graduate and doctoral degrees in topics like business administration, nursing and social work. The College of Business Administration at UIC offers an online bachelor of business administration degree completion program for students seeking to advance professionally by finishing their degrees. The online business degree program is designed to prepare graduates for careers in business leadership and operations or in advanced business studies. U of I provides students with a strong foundation in key subject areas. The curriculum features courses in finance, marketing, accounting and organizational management. Applicants to the bachelor’s degree in business must have either an associate degree or a minimum of 60 transferable credit hours. New students must begin the program in the fall. New Students form a cohort and can complete coursework at their own pace. The University of Illinois at Chicago is accredited by the Higher Learning Commission (HLC). The College of Business Administration is accredited by the Association to Advance Collegiate Schools of Business (AACSB). Mississippi College is a private Baptist college that was established in 1826. It enrolls a tight-knit student population of over 5,000 students in a variety of undergraduate, graduate and professional degree programs. Students develop the knowledge and skills necessary for a variety of careers in business administration. This accelerated online bachelor’s degree in business engages students with current topics and issues in the field, which develops their ethical, critical, and global perspectives on 21st century business. The program utilizes eight-week courses. Mississippi College is accredited by the Southern Association of Colleges and Schools Commission on Colleges (SACSCOC). The School of Business is accredited by the Association to Advance Collegiate Schools of Business (AACSB). East Carolina University is a public research university that was established in 1907. It enrolls over 29,000 students in a full selection of undergraduate, graduate and professional degree programs. Students in the online business degree program receive the same education from the same faculty who teach the on-campus students. East Carolina University also offers an online MBA degree program. East Carolina University is accredited by the Southern Association of Colleges and Schools Commission on Colleges (SACSCOC). The College of Business is accredited by the Association to Advance Collegiate Schools of Business (AACSB). The University of Missouri is a multi-campus public university system that was founded in 1839. It enrolls over 30,000 students at its flagship campus in Columbia, and it offers a wide selection of undergraduate, graduate and professional degree programs. The Trulaske College of Business at the University of Missouri offers an online bachelor of science in business administration degree completion program for busy students seeking to finish up their studies and advance professionally. Designed for flexibility and convenience, the online business degree can be completed in two years of study through 100 percent online courses. Students in the online BSBA program must complete an internship. Applicants to the program must have at least 54 transferable credits for admission. The University of Missouri is accredited by the Higher Learning Commission (HLC). The Trulaske College of Business is accredited by the Association to Advance Collegiate Schools of Business (AACSB). The University of Illinois–Springfield (UIS) is a public university that enrolls about 5,000 students. UIS is part of the University of Illinois system, and it offers nearly 50 undergraduate and graduate degree programs as well as a doctorate in public administration. UIS’s College of Business and Management offers an online bachelor of business administration degree program that provides students with a broad foundation of knowledge in key business topics. As a degree completion program, the online BBA serves busy, working students who have already completed some college coursework and seek to finish their studies. Online business degree students can choose one of two options: a comprehensive business administration option or a BBA management concentration. Students earning the online business degree must complete a capstone. Faculty members who teach the on-campus courses also teach the online courses. Both online and on-campus courses use the same curriculum. Applicants to the online bachelor of business administration degree program must have at least 45 transferable credit hours for admission. Students may complete the program in two years of study. The University of Illinois–Springfield is accredited by the Higher Learning Commission (HLC). The College of Business and Management is accredited by the Association to Advance Collegiate Schools of Business (AACSB). Western Carolina University is a public university established in 1889. It enrolls over 11,000 students in a variety of undergraduate, graduate and professional degree programs. Students in the online bachelor’s degree in business program complete the same courses and receive instruction from the same faculty who teach the on-campus students. Western Carolina University is accredited by the Southern Association of Colleges and Schools Commission on Colleges (SACSCOC). The College of Business is accredited by the Association to Advance Collegiate Schools of Business (AACSB). Oregon State University is a public research university established in 1868. It enrolls about 30,000 students, which makes it the largest school in Oregon. OSU is a multi-grant institution; it has a land-grant, a space-grant, a sea-grant and a sun-grant. Oregon State offers more than 200 programs that lead to undergraduate, graduate and doctoral degrees. Through its OSU Ecampus and the College of Business, Oregon State University offers an online bachelor of business administration degree program that prepares graduates for careers in finance, market research, management and training. Students have the option to earn their BBA in one of two tracks: Bachelor of Arts or Bachelor of Science. Students can complete the online business degree in four to six years. Students who already hold a bachelor’s degree can earn a post-baccalaureate degree in business administration online. Students complete 112 credits in pre-business core and pro-school core courses. Oregon State University also offers an online MBA degree program . Oregon State University is accredited by the Northwest Commission on Colleges and Universities (NWCCU). The College of Business is accredited by the Association to Advance Collegiate Schools of Business (AACSB). The University of Iowa (UI) is a public research university founded in 1847. Its 12 colleges offer more than 200 areas of study that lead to undergraduate, graduate and professional degrees. UI enrolls over 32,000 students. UI’s Tippie College of Business offers an online bachelor of business administration degree program that emphasizes management and includes a concentration in entrepreneurial management. The online BBA degree program also covers strategic business planning, which helps students develop the knowledge and skills necessary for professional success. Nationally distinguished faculty members teach the online program. The University of Iowa is accredited by the Higher Learning Commission (HLC). The Tippie College of Business is accredited by the Association to Advance Collegiate Schools of Business (AACSB). Drexel University is a private research university that was founded in 1891. It enrolls more than 24,000 students. The university offers more than 170 academic programs that lead to undergraduate, graduate, doctoral and professional degrees in a variety of disciplines. The online bachelor’s degree in business requires one four-day, intensive residency. Drexel University is accredited by the Middle State Commission on Higher Education (MSCHE). The LeBow College of Business is accredited by the Association to Advance Collegiate Schools of Business (AACSB). Florida Atlantic University is a public university established in 1961 that enrolls over 30,000 students in a full selection of undergraduate, graduate and professional degree programs. FAU’s College of Business offers an online bachelor of business administration degree program has several options: accounting, management, marketing, and hospitality and tourism management. Students in the online BBA program develop the knowledge and skills necessary for a variety of business administration careers. Students in the online business administration degree program take the same courses and are taught by the same faculty who teach the on-campus students. Florida Atlantic University is accredited by the Southern Association of Colleges and Schools Commission on Colleges (SACSCOC). The College of Business is accredited by the Association to Advance Collegiate Schools of Business (AACSB). Kansas State University is a public research university that was established in 1863. It enrolls over 22,000 students in a variety of undergraduate, graduate and professional degree programs. Kansas State University is accredited by the Higher Learning Commission (HLC). The College of Business Administration is accredited by the Association to Advance Collegiate Schools of Business (AACSB). The University of South Dakota is a public research university that was established in 1862. It enrolls over 10,000 students in a variety of undergraduate, graduate and professional degree programs. The USD’s Beacom School of Business offers an online bachelor of business administration degree program for busy, working students who want to advance without sacrificing their current careers. The program develops foundational knowledge in key areas like leadership, management, marketing and communications. Students can focus their degree on specific areas of interest with elective coursework. Students in the online bachelor of business administration degree program are taught by the same faculty who teach the on-campus students. The University of South Dakota is accredited by the Higher Learning Commission (HLC). The Beacom School of Business is accredited by the Association to Advance Collegiate Schools of Business (AACSB). The University of Massachusetts–Lowell is a public research university founded in 1894. UMASS Lowell is part of the University of Massachusetts system. Its 18,000 enrolled students make it one of the largest schools in Massachusetts. The university offers more than 200 programs that lead to bachelor’s and master’s degrees as well as doctoral degrees in criminal justice, music, engineering and more. The University of Massachusetts–Lowell offers an online Bachelor of Science in Business Administration degree through its Division of Online & Continuing Education and the Manning School of Business. The program helps students develop strong communication, leadership and analytical skills for their future careers in the global economy. The university offers a part-time business administration degree program that has both fully online and hybrid options. Students in the online business degree program are taught by the same faculty who teach the on-campus students. University of Massachusetts–Lowell is accredited by the New England Association of Schools and Colleges (NEASC). The Manning School of Business is accredited by the Association to Advance Collegiate Schools of Business (AACSB). The University of Arizona is a public research university that was established in 1885. UA enrolls over 43,000 students in a full array of undergraduate, graduate and professional degree programs. The University of Arizona also offers an online MBA degree program. Auburn University is a public research university that was established in 1856. It enrolls over 29,000 students in a variety of undergraduate, graduate and professional degree programs. Applicants to the online BSBA program must hold 63 transferable credit hours that fulfill specific program perquisites. Quinnipiac University is a private, coeducational and nonsectarian university that was established in 1929; it enrolls over 10,000 students. Through eight schools and colleges, Quinnipiac offers a host of undergraduate, graduate and professional degrees, such as degrees in business, law and education. Applicants must have a minimum of 45 transferable credits, and can transfer up to 76 credits. A bachelor of business administration (BBA) is a type of bachelor’s in business degree. Students who earn this degree have typically completed a full program of general, advanced, elective and concentration-specific courses at a public or private four-year university. A BBA is designed to provide you with the principles, knowledge and skills you need to navigate today’s business landscape. Online business degree programs develop your managerial, communication and leadership skills. They also allow you to specialize in a specific area with a degree concentration. These programs may also blend online business classes with real-world internship experiences. If you want to get a job at a top firm, then you probably need a BBA. Online business school students like you can continue to advance professionally while enjoying the flexibility of studying from home. Students with a BBA are eligible to apply for online MBA programs. The difference between a BBA, a BSBA and BABA is that a BBA focuses on a broad overview of business topics while a BSBA and BABA include other subjects. A Bachelor of Business Administration degree will emphasize management, marketing and economics. In addition to business studies, a Bachelor of Science in Business Administration (BSBA) requires courses that focus on the mathematics of business, such as financing and analytics. A Bachelor of Arts in Business Administration incorporates liberal arts courses with its business curriculum. What’s the Association to Advance Collegiate Schools of Business International (AACSB) Accreditation? The Association to Advance Collegiate Schools of Business International is the organization that accredits undergraduate and graduate business schools. The association also accredits accounting programs. A school with AACSB International accreditation has received a positive evaluation for the school’s mission, operation and programs as well as faculty qualifications and contributions. AACSB International accreditation is the most recognized form of specialized and professional accreditation for business programs and educational institutions. While AACSB accreditation is the most important programmatic accreditation for business degrees, you still want to make sure that you find a program at a regionally accredited college or university. Every school featured on this list of the best online BBA programs is regionally accredited, as are all the colleges and universities that we rank.